Dynamic women designers and artists from the mid-20th century and today create innovative designs, maintain craft traditions, and incorporate new aesthetics into fine art in Pathmakers: Women in Art, Craft, and Design, Midcentury and Today, now on view at the National Museum of Women in the Arts. Each week, compare and draw parallels between works on view in Pathmakers and NMWA collection favorites. Apfelbaum is perhaps best known for her “fallen paintings”—large-scale installations consisting of hundreds of hand-cut and hand-colored velvet fabric pieces arranged on the floor. Her complex, color-charged work in Pathmakers similarly defies the boundaries between art and craft and between painting and sculpture. 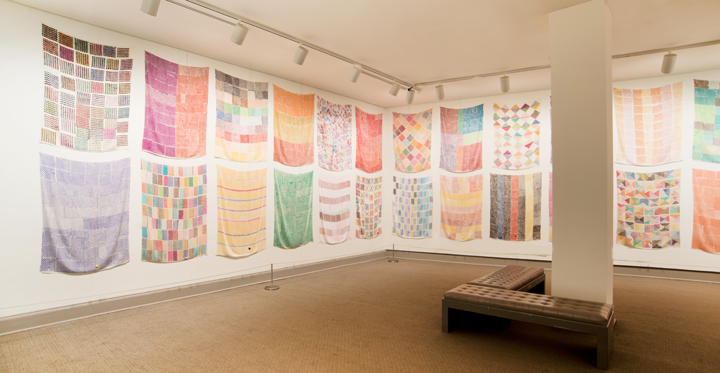 American contemporary artist Polly Apfelbaum (b. 1955) was born in Abington, Pennsylvania, and currently resides in New York. She earned her BA at SUNY Purchase College and her BFA at the Tyler School of Art. Apfelbaum finds inspiration in structures, systems, and most importantly, color. Apfelbaum stated, “I can’t imagine too much color.” A singularly inventive artist, she creates works that push past traditional disciplinary forms into the realm of pop culture. Apfelbaum’s installation was inspired by a book of the same name—A Handweaver’s Pattern Book. Originally published in 1944 by Marguerite Porter Davison, the reference manual catered to women with an interest in weaving during the post-war period. Apfelbaum translated the book’s weaving designs into three-by-five-foot rectangular panels of synthetic velvet. Using a found plastic punch card as a stencil, the artist colored fields of evenly-spaced dots with a marker. Her method and materials give the work a shimmering, vibrating effect. Hung around the gallery walls, 40 panels are accompanied by strings of ceramic beads suspended from the ceiling. Apfelbaum’s work is representative of the exhibition’s section dedicated to contemporary women artists and designers who reflect and expand upon the works of earlier generations. Presenting an alternative to traditional painting, Apfelbaum responds to the history of handmade textiles. In NMWA’s collection, Iris, Tulips, Jonquils, and Crocuses (1969) by Alma Thomas also contains dynamic colors and pointillist forms. Thomas’s painting resembles a mosaic of lozenge-shaped brushstrokes where tiny tesserae arranged in long bands form a unified image. 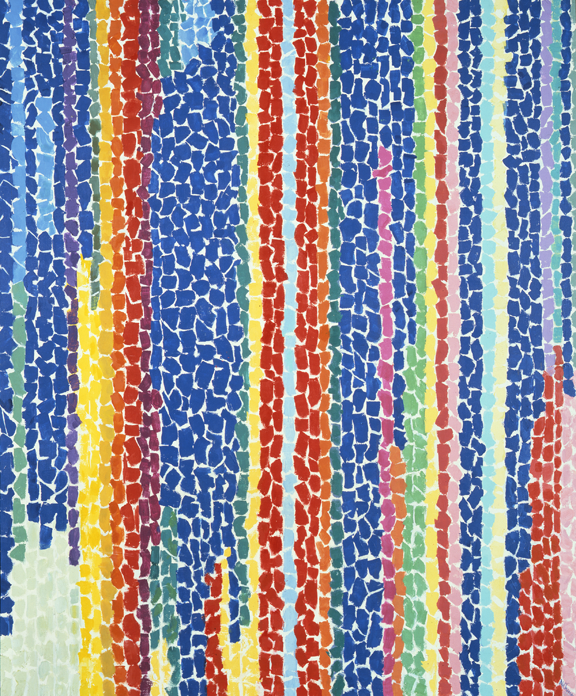 Known as “Alma’s Stripes,” this abstract style became Thomas’s signature method toward the end of her career. Like Apfelbaum’s work, Thomas’s painting contains kaleidoscopic, eye-popping color. Thomas often found inspiration in the colors and patterns in her garden. Although Iris, Tulips, Jonquils, and Crocuses may seem spontaneous, Thomas deliberately planned her works. She often made watercolor sketches or placed free-hand pencil marks on the canvas as a guide (some of which are still visible). Visit the museum and explore Pathmakers, on view through February 28, 2016. —Sarah Mathiesen was the fall 2015 publications and communications/marketing intern at the National Museum of Women in the Arts.